Steel pipelines can be protected against external corrosion by two perfectly interlocking methods: passive corrosion protection by a high-grade pipe coating, with classic cathodic corrosion protection (CCP) serving as the active complement. But CCP can do much more. It is an indispensable part of condition-based maintenance and as such provides a valuable contribution towards management systems for the assessment of pipeline integrity (PIMS). 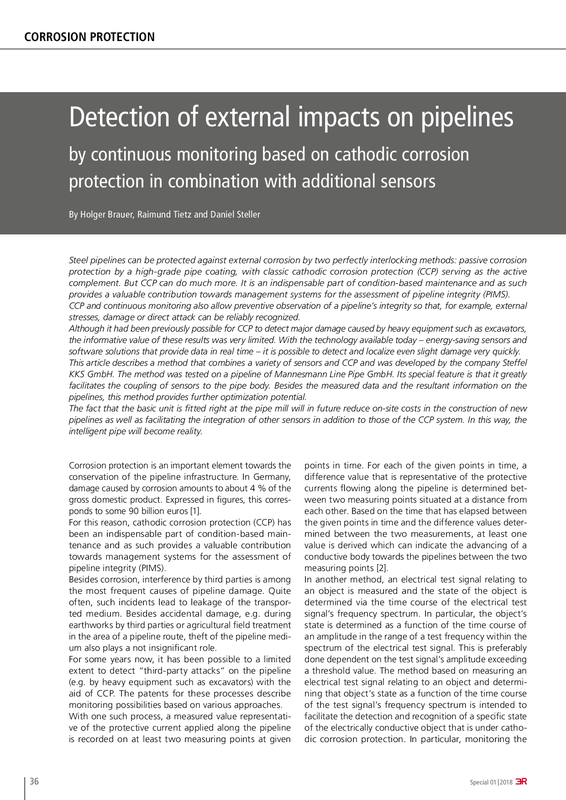 CCP and continuous monitoring also allow preventive observation of a pipeline’s integrity so that, for example, external stresses, damage or direct attack can be reliably recognized. Although it had been previously possible for CCP to detect major damage caused by heavy equipment such as excavators, the informative value of these results was very limited. With the technology available today – energy-saving sensors and software solutions that provide data in real time – it is possible to detect and localize even slight damage very quickly. This article describes a method that combines a variety of sensors and CCP and was developed by the company Steffel KKS GmbH. The method was tested on a pipeline of Mannesmann Line Pipe GmbH. Its special feature is that it greatly facilitates the coupling of sensors to the pipe body. Besides the measured data and the resultant information on the pipelines, this method provides further optimization potential. The fact that the basic unit is fitted right at the pipe mill will in future reduce on-site costs in the construction of new pipelines as well as facilitating the integration of other sensors in addition to those of the CCP system. In this way, the intelligent pipe will become reality.